The grounds of the Barony A-Frame and surrounding post-industrial land are rich in wildlife. Infertile, often compacted, substrates prevent grasses taking over allowing wildflowers to thrive. These in turn are a pollen and nectar source for insects such as butterflies that also appreciate warm bare surfaces on which to bask. Spiders and beetles ambush prey from stones and plant tussocks. Apply named mining bees forage on the flowers and make nest in the spoil material. Birds feed on insects or seeds depending on the time off year. The Barony site is a favourite haunt for wildlife enthusiasts as you are sure to see a good range of species and possibly encounter something a bit unusual. Only recently, the rare and endangered yellow bird’s-next plant was found in good numbers on both the A-Frame site and the wider bing area. This strange looking, harmless parasite of trees needs a fungus to connect it to its host. Other interesting plants of the A-Frame site include water figwort, wintergreen and broad-leaved helleborine. Butterflies such as ringlet, small heath and common blue are usually seen in good numbers but look out for a small brown one with a darting flight. 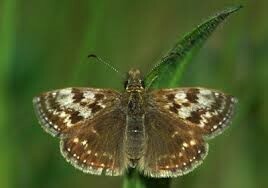 It could be the dingy skipper, a UK priority butterfly known to occur here. fungus as an intermediate connection to host. It has a perennial underground stock and flowers sporadically in July to be pollinated by an insect. There are no green leaves because, as a parasite, it does not need to photosynthesise. 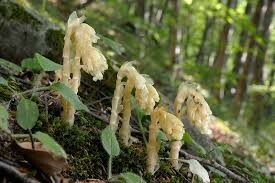 Rare and endangered in Scotland (there are only 4 other known locations, none elsewhere in Ayrshire). Found both on the A-Frame site and the wider bing area in 2014. Dingy skipper butterfly – of UK importance (UKBAP priority list, Scottish Biodiversity list). A small butterfly with low darting flight. A moth-like butterfly that likes open bare habitat such as post-industrial sites.